Read on for common symptoms and how you can prepare yourself or someone you know for the disorder. Thanks to the honesty of stars such as Brooke Shields, Hayden Panettiere, and Drew Barrymore, postpartum depression (PPD) now shows up more in the news. While increased discussion is great, many moms still may not understand what the disorder is and how it can affect them. 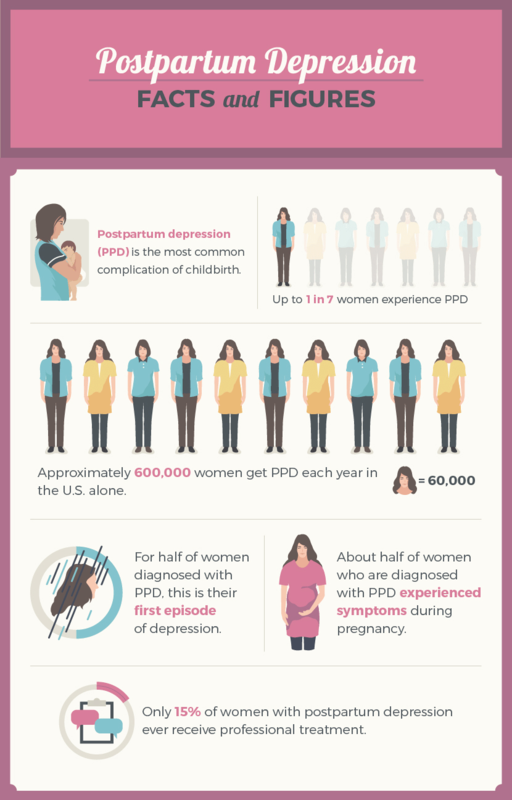 PPD is a mood disorder that affects mothers in the weeks and months after the birth of a baby. Normal baby blues—the hormonal shift after birth that results in crying, uneasiness, and mood swings—should dissipate within two weeks. After that point, any lingering, worsening, or drastic changes in mood may indicate that a woman is experiencing postpartum depression, anxiety, obsessive compulsive disorder (OCD), or another perinatal mood or anxiety disorder. Additionally, while perinatal mood and anxiety disorders can start after that initial hormonal shift, PPD can start any time during the baby’s first year. Approximately 10 to 15 percent of women suffer from postpartum mood disorders, though the numbers may actually be higher due to underreporting, misdiagnosis, and lack of awareness. While there's no single test used to diagnose PPD, doctors sometimes ask mothers to complete a depression screening questionnaire. Some places, including New York City, are making this screening mandatory both before the baby is born and at the six-week checkup. Other doctors may not be as proactive, and some women may need to request a screening. Blood tests are typical as well to rule out thyroid problems or other medical issues that can have symptoms similar to those of PPD. PPD can present itself in many different ways. Not all moms experience every symptom associated with the disorder, and a mother who was diagnosed with PPD after a previous birth may experience completely different symptoms after a subsequent birth—or no symptoms at all. 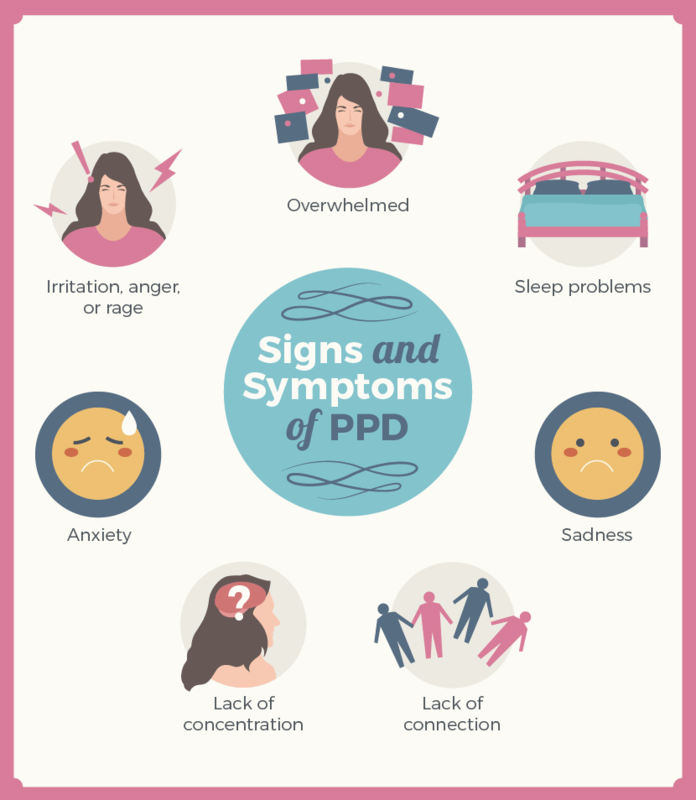 These are some of the symptoms moms with PPD may experience. When a baby cries, women with PPD often feel more irritated than moms without PPD. They can get angry at the baby when it's time to change another diaper or feel unadulterated rage when the baby won't go to sleep. Anger can extend outward to a woman’s partner, friends, family, and even strangers. Women with PPD often feel overwhelmed by motherhood and the arduous task of parenting. Instead of recognising this as a time of change and transition, they may view it as a personal failure. They can feel like an unfit mother because they struggle to stay on top of cooking, cleaning, and new parenting duties. Women with PPD often feel withdrawn or like they are not bonding with their baby. They don't feel like doing things with other people and may cancel plans or avoid phone calls or texts. PPD sufferers may feel nothing at all or a total apathy about absolutely everything. Sadness is a more recognisable sign of depression, but this type feels bone deep. It feels like it may never end, and women with PPD fear they will never feel happy again. The old adage "Sleep when the baby sleeps" isn’t always feasible for women with PPD. They struggle to sleep at night or nap during the day. Or, on the flip side, all they want to do is sleep, but it feels like no amount of sleep will help get them caught up. Women with PPD have difficulty focusing on tasks at work or at home. Completing a simple to-do list can feel insurmountable. PPD and anxiety often go hand-in-hand. PPD sufferers may find themselves afraid to walk down stairs with their baby or may contrive worst-case outcomes for every scenario. They may feel paralysed by fear. While not every new mom experiences PPD, mothers (and their babies) are best off when they consider whether they have a predisposition for it. Risk factors include young age; unplanned pregnancy; previous mental illness such as depression, bipolar disorder, or anxiety; a stressful delivery; family history of mental illness; a poor relationship with the baby's other parent; money problems; and a poor support system. If you check any of these risk factor boxes, let your doctor know while you're still pregnant so everyone is on the same page. 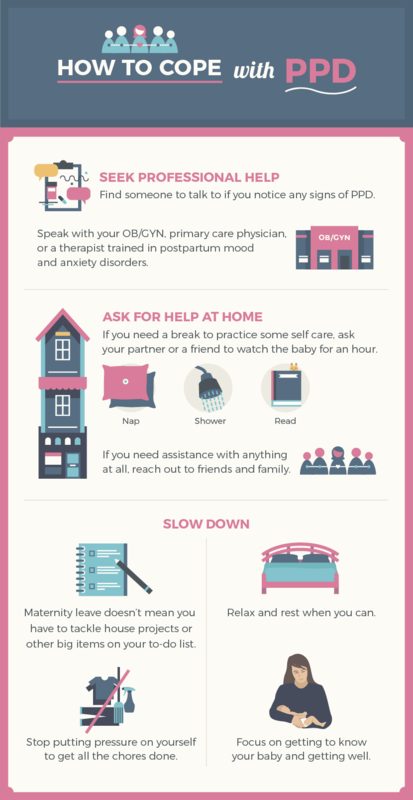 You can also connect with a therapist during pregnancy to set up a plan for after birth. Planning ahead allows time to research the effect of certain medications on breastfeeding, set up steps to seek help, and lessen some of the chaos that can ensue when PPD hasn't been discussed and becomes an emergency. Postpartum depression will not just go away on its own. It is not a “Pull yourself up by your bootstraps and power through” type of illness. But with proper help and guidance, you can get better. Perinatal mood disorders are temporary and treatable with professional help. Speak with an OB/GYN, a primary care physician, or a therapist. If you don't have a therapist, ask your doctor or trusted friends for a referral or recommendation. Not every mom needs antidepressants or anti-anxiety medication, though some do. Therapists trained in postpartum mood and anxiety disorders help many mothers get through this difficult time. Initially, it may seem impossible, but taking time for self-care is of the utmost importance. It looks different for each mom, but in time you'll find something that works for you. Ideas include taking a nap when you can, showering regularly, reading or journaling, art therapy, exercise, and eating well. Nutritious meals and snacks help keep energy levels up and provide the proper nutrients to get through the day. This is especially applicable to women who are breastfeeding. A quick tip is to always have a snack on hand, such as a protein bar, a piece of fruit, or some nuts. Additionally, carry a bottle of water with you to make sure you stay hydrated. 3. Ask for help at home. This is different than seeking medical help: it means asking for help at home and with the baby. If you need a break to take a shower and practice some self-care, ask your partner or a friend to care for the baby for an hour. If you need some meals delivered, ask. If you could use a ride to a therapy appointment, ask. People want to help, but they don't know how to help if you don’t ask. There is no shame in asking for help. Don't view your maternity leave as a time to tackle house projects or other big items on your to-do list. You just birthed a baby, and you're dealing with a mood disorder. Slow down. Turn off the ringer on your phone, relax and rest when you can, and stop putting pressure on yourself to get all the chores done. Focus on getting to know your baby and getting well. Postpartum mood disorders such as PPD are temporary and treatable. Know that you will get through this hard time. Article originally published in Fix.com. Edited and reposted with permission.